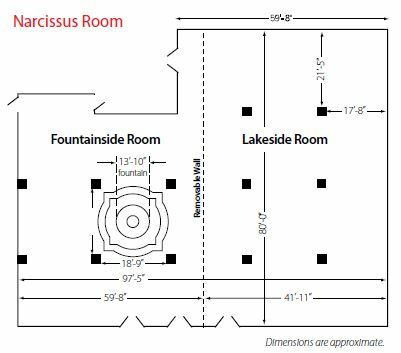 Located on the 7th floor of Macy’s Chicago State Street store, the Narcissus Room is our popular meeting space with classical style. The room is perfect for a variety of events including presentations, meetings, receptions and sit-down meals. The space can be divided with an airwall into the Fountainside Room and Lakeside Room, which can be used for different purposes at the same time. Fountainside Room: The west side of the room features a working, elegant marble fountain. Lakeside Room:The east side of the room features large windows on 2 exterior walls providing natural light and city views. The Narcissus Room includes a built-in sound system with iPod hookup.